When a family member or friend becomes suspicious that their loved one may be showing symptoms of prescription drug abuse it is critically important to know what to look for. Detecting the signs of a friend or family member with a drug addiction can be very difficult. Not all people suffering from an addiction manifest their symptoms the same way. While one person who has an addiction might appear withdrawn and quiet another might seem more outgoing and energetic. This makes it very difficult for family with a suspicion of addiction to know what to do. When a loved one is battling an addiction to a prescription drug it becomes even more complicated. This is because there are several classes of prescription drugs each with its own physiological symptoms. Therefore detecting the symptoms of prescription drug abuse can be extremely difficult. There are three major classes of prescription medications that are commonly noted to have addictive qualities. The first are opiods (for example oxycodone), which are used to treat pain. The second class is anti-anxiety medications and sedatives. Drugs like Valium and Ativan are used primarily to treat various anxiety disorders and sleep disorders. The final category is stimulants. Stimulant drug, like those used to treat children with ADHD can commonly be misused. There are also Symptoms of prescription drug abuse that span all three categories. â€¢ Constantly seeking medications or more medications from various medical practitioners. â€¢ Stealing medications or money from friends and family. â€¢ Visiting several doctors for different prescriptions. Obviously the symptoms of prescription drug abuse are various and widespread. Knowing what to look for helps individuals and family members keep watch for when help is needed. 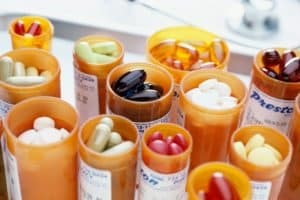 Any drug addiction is difficult to deal with but prescriptions drugs pose an even bigger set of obstacles to overcome. Thankfully help is available and waiting for those individuals who are ready.